Fortified soy milk is a nutritious alternative to cow’s milk. Earlier this week, Dietitians of Canada and the Canadian Paediatric Society released a joint statement advising parents to go easy on feeding babies and young children plant-based beverages such as almond, cashew and rice "milks." Relying on non-dairy beverages can shortchange infants and kids much-needed nutrients, the organizations warned, and, in so doing, can rob them of their full growth potential. Instead, cow's milk (or a fortified soy beverage) should be the main beverage given to kids ages two through eight. That may seem like contradictory advice to parents who are trying to limit their child's intake of dairy for health reasons. Milk allergies (real or perceived), lactose-intolerance and veganism can prompt parents to seek out alternatives to cow's milk. It's also believed that eating more plant-protein foods makes for a healthier diet. And it can. Yet, most milk alternatives are lacking protein and some are missing other key nutrients that growing kids need. Here's what you need to know about plant-based beverages for kids and which ones are nutritious alternatives to cow's milk. Children aged two to eight years need 13 to 19 grams of protein each day to support growth and development. Since young children are growing rapidly, they need more protein per pound of body weight than do older kids and adults. Two cups (500 mL) of milk or soy beverage deliver 16 g of protein, while the same amount of almond, cashew, coconut or rice beverage supplies about 2 g. Hemp beverages offer a bit more, 6 g per two cups. Fat, which supplies extra calories for growth and is needed for a child's developing brain and nervous system, may also be lacking in plant-based beverages. Two cups of whole milk supply 16 g of fat, 40 to 50 per cent more than the same amount of hemp, coconut and soy beverage. Rice, cashew and almond beverages contain even less fat. Even so, it's not difficult to supplement your child's diet with fat (more on that later). The lower calorie counts of plant-based beverages are a concern, too. Some unflavoured (original) beverages – almond, cashew, coconut – supply less than half the calories found in whole and 1-per-cent milk, 160 and 110 calories per cup, respectively. Rice and hemp beverages have more, 120 to 140 calories per cup. Unsweetened versions have considerably fewer calories (30 to 70 per cup) which, if consumed as the main beverage (e.g., two cups a day), can prevent a child from meeting his or her daily calorie requirements. Filling up on low-calorie plant beverages can also dampen hunger, causing children to eat less food. Many plant-based beverages are fortified with vitamins and minerals that growing kids need, but some are not. Fortification is voluntary; manufacturers that choose to fortify must add vitamins A, D, B12, riboflavin (B2), zinc and calcium. Other nutrients, including folic acid, thiamin, niacin, magnesium and potassium, are optional. For these reasons, Health Canada recommends that children ages two to eight years who are not breastfed drink two cups of cow's milk or fortified soy beverage each day. Two cups supply 16 g of protein, 600 mg of calcium and 200 IU of vitamin D.
To get the fat that young kids need, homogenized milk (3.25-per-cent milk fat) is recommended until age two. Cow's milk should not be introduced, however, until 9 to 12 months of age. Even so, young children don't need to avoid drinking plant-based beverages like almond, rice or cashew milks, provided they're not staple drinks (i.e., less than two cups per day). 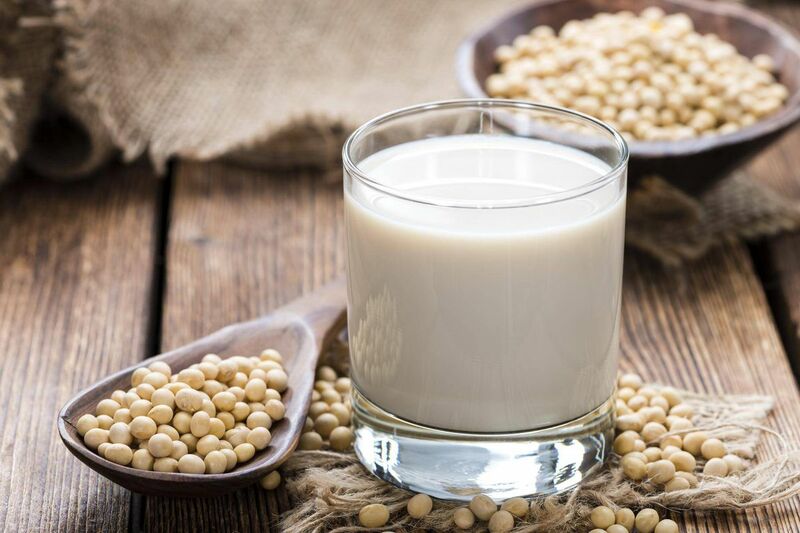 Fortified soy milk is one alternative to cow's milk but it's not the only plant-based beverage that delivers protein. If child is allergic to soy, there's another option. Pea "milk" (Ripple Foods, Bolthouse Farms), a relative newcomer to the non-dairy refrigerated case, is a protein-rich, vegan, lactose-free and nut-free alternative. Made from yellow peas, this non-dairy alternative delivers 8 to 10 g of protein per cup. It's also fortified with calcium and vitamins A and D. Bolthouse Farms also adds vitamin B12 to its product. Pea protein beverages are lower in fat than whole milk, delivering about 5 g per cup, similar to soy milk (versus 8 g for whole milk). If cow's milk or soy beverage isn't the right option for your child, choose a fortified plant beverage and offer extra protein and fat elsewhere in his or her diet. Consult with a dietitian to be sure. Children who rely on plant-based beverages should also supplement their diet with healthy fats such as nut butter, hummus, avocado, whole eggs (if not allergic) and vegetable oil.